Oh hey, Netflix does know what I like. “Shows with a strong female lead” is now one of the categories it offers to me. Interesting I should notice this tonight, after reading an article today documenting the dearth of women in contemporary movies. I suppose I have been tending toward the strong female leads lately, given a wide variety of choices. My husband and I lived without a television for many years, at his request. But now we are TV owners and get most of our shows through Netflix instant streaming. (We don’t actually have a cable package and I don’t see one in our near future.) There is a gender divide when it comes to watching habits in my household. My husband and 15-year-old son watch something on rare occasions; my 18-year-old daughter and I are the main viewers. I’m catching up on stuff I missed over the years. So much Star Trek! I watched Next Generation and Deep Space Nine – all of the episodes. Then, without noticing it, I started a series of series with women at the fore: Thirty Rock, Star Trek Voyager, a British mysteries series called Rosemary and Thyme. 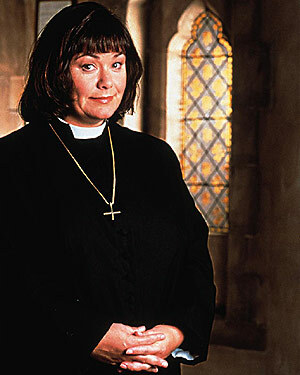 Currently my daughter and I have a standing Thursday evening date to watch Vicar of Dibley, starring the very funny Dawn French. I remember some shows I used to watch when I was a kid. For a while my brother and I sat glued to reruns of The Wild Wild West after school almost every day. Or maybe only I was glued, but I recall him being there. I loved tracking the exploits of two undercover agents in the old west. They employed clever disguises and even cleverer technological gizmos. I used to pretend to have adventures with James West and Artemus Gordon. I’d help them recover the stolen treasure. I’d disguise myself as a sheriff or a poker player or whatever the situation called for. Together we’d outsmart the villain. Often, the two heroes required rescuing by me. I made my mom nervous as many of these games involved climbing around in the trees in our back yard, to the highest branch I could reach. I managed to overlook the typical women’s roles in the show, which were, as I recall, to look pretty, wave a fan while batting eyelashes, fall in love with the agents, get held hostage, and things along those lines. Then one day I could ignore it no more. I came home, settled in with my snack, and turned on the tube, eager to see what my heros were up to that afternoon. To my short-lived delight, the two leads fell in with a woman who was their match. She dressed in practical clothing that allowed her to move through action scenes. She shot guns. She did everything the guys did – everything I did in the stories I made up. It was thrilling. So thrilling! Right up until the gentleman solved the “problem” of her behavior by getting a proper woman to convince the strong female lead how delightful it would be to put her energy into wearing frills and make-up instead doing all that tiresome actiony stuff. I still get a bad feeling in the pit of my stomach when I think of the final scene, where my two ersatz partners in daydream adventure grinned at each other with self-satisfied smirks over the two women giggling in the background, the tomboy having been shown her place. I watched a few more episodes after that, but any enjoyment on my part was half-hearted. No longer could I gloss over how people of my gender were portrayed and treated. No longer could I fail to acknowledge the lack of any place for a girl in these adventures. I’d like to be able to look back and say, “What was it with that one show anyway?” But it wasn’t only The Wild Wild West. I had the same experience multiple times. Starsky and Hutch. Let’s talk about them, shall we? I didn’t have quite the attachment to these two buds as I did to the West/Gordon duo, but I liked the show pretty well. They engaged in entertaining banter sometimes and besides, all the kids at school watched it, so I needed to be in the know or be left out of conversations. I was a little older and a little more skeptical. Already, I had to work to suspend my disbelief over some of the plots. “You’re going undercover as a hair stylist? Really? You can do that without the months of training that hair stylists go through? Gonna just pick up a pair of scissors and start snipping?” I may have rolled my eyes, but I continued to tune in. Until the episode with the reporter. A female reporter arranged to shadow Starsky and Hutch so she could write a feature on them. Did I forget to mention? An attractive female reporter. The two police officers proceeded to act a lot like some of the sixth-grade boys in my class at school, trying to impress the girl by being jerks. As the story unfolded I found myself thinking the two cops should be glad I wasn’t the reporter, because I’d write something pretty scathing. As it turned out, the reporter wrote a pretty scathing piece about them and their not really cool or constitutional antics. Ha! I laughed, figuring they were going to see what they really looked like to others and mend their ways. Yeah, not so much. They got angry. And then they got even by more or less kidnapping the reporter and acting like even bigger, more unconstitutional jerks, to show her. And she learned her lesson. Properly chastened, she wrote a retraction of her previous article, explaining how the two men were true heroes, something her tiny brain had been unable to grasp at first. I never watched another episode after that. Ever. To this day. Properly chastened – this was the most galling part to me. It was bad enough that the male leads thought the women needed to be put in their places and treated them accordingly. The worst thing was how meekly the women accepted it. With humility, they came to realize and admit they had no business trying to do the same things men did, nor any right to criticize a man’s actions, especially not a male authority figure. And Starsky and Hutch were supposed to be rebel cops – hmph! But wait, there’s more! Off the top of my head, I can come up with two more shows in which women’s roles were mansplained in ways that caused female characters to see the light. The Courtship of Eddy’s Father and My Three Sons both broadcast episodes with such edifying storylines. And don’t even get me started on the number of times I saw this scene repeated: Female guest star is being all female and hysterical, because she’s got it in her head that people should listen to her or something. So male lead grabs her and kisses her. She resists, but he doesn’t stop! Until she melts into his arms, because all she needed to be soothed out of her irrationality was to be force-kissed. My dad wasn’t anything resembling a feminist, but I’m pretty sure his view on someone kissing me against my will was that I should punch the guy if I could. 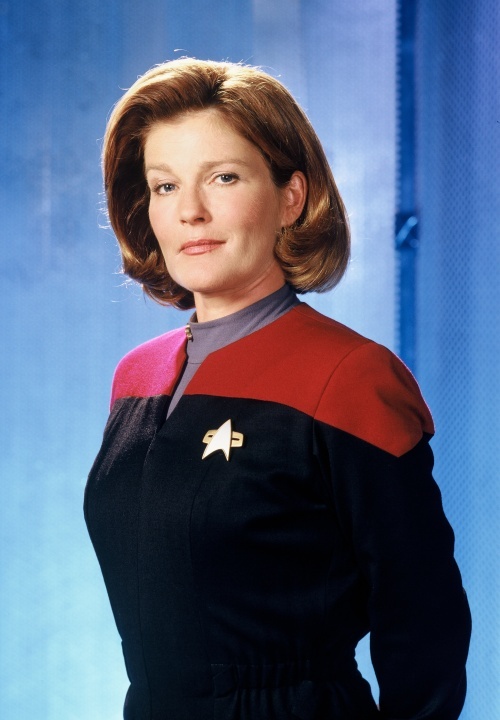 So now I have access to shows with strong female leads and I say “Yes, please!” Give me Captain Janeway, in charge all on her own, nobody having her back. No Starfleet Command available for consultation or reinforcement. Making all of the tough decisions and taking all of the consequences. Give me Voyager, which passed the Bechdel Test as a matter of routine. Give me scenes of three female crew members putting their heads together to fix a problem with the starship’s engine. Give me Liz Lemon on 30 Rock, supervising a crew of eccentrics and somehow getting them all to do their jobs. Give me a female character who loves to eat as much as I love to eat and who is not apologetic about it. One who is truly flummoxed when forced to choose, at the airport gate, between the man she loves and the sandwich she loves. 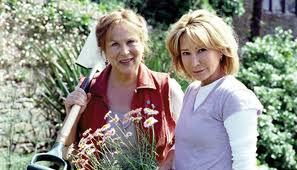 Give me Rosemary Boxer and Laura Thyme, two middle-aged women who run their own gardening business and solve murder mysteries on the side, who dress in actual gardening clothes, duck boots and all. Their hair comes all unkempt and they get dirty. Plus they’re smart enough and brave enough to catch the criminals. Give me a small English village’s first female vicar, one who can hold her own with the moneyed town councilor who is used to getting his way. One who is wise and caring and fallible and funny. One who is a strong female lead. Thanks for the category, Netflix.